Blue on a Wall, originally uploaded by Judi FitzPatrick Studio. 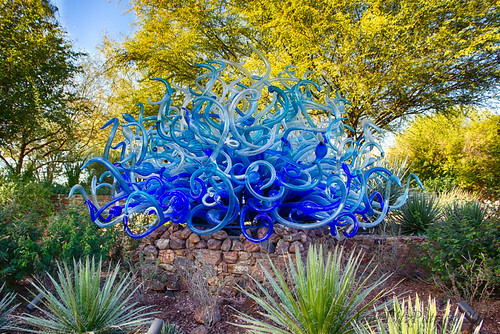 Chihuly sculpture captured at Desert Botanical Gardens in Phoenix, AZ, February 11, 2014. Fascinating. Have you ever been to Bellagio in Las Vegas? They have a huge amount of Chihuly hanging from the ceiling in one of the atriums. I haven't been there, Jim, but it sounds very cool. Did you see the Chihuly exhibit when it was at the MFA Boston a couple of years ago? They still have one in the new wing on the main floor - a tall, spiky green one.